Are we planning correctly? Will we make money? How do you know? The answer lies in developing and analyzing the projections and budgets for your business. The first and most basic component of any operating budget is the sales budget, which lists the expected units and revenue expected from the sales plan. This budget may also be referred to as a forecast. Overall, the more accurate your sales forecast, the more effectively you can manage your business. All types of corporate planning require a multitude of spreadsheets. Small businesses just like large corporations will have many different spreadsheets used and created collaboratively. Ultimately, planning spreadsheets will all tie into the three basic financial statements a company uses to analyze and plan its business operations: the income statement, balance sheet and cash flow statement. A sales forecast is often primarily used to build out the projected income statement for a business. There can be simple sales forecasts that focus just on the projected unit sales or more comprehensive forecasts that divest from the income statement and include planning for variables such as direct costs of goods sold and indirect costs of marketing campaigns. As such, sales forecasts and budgets can take many forms and serve many different purposes. The best starting point for any sales forecast or budget is a spreadsheet template or model that is built to meet the sales forecast needs. 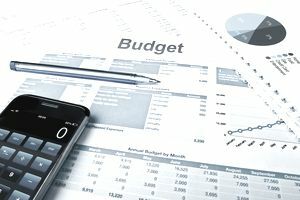 The sales budget memorializes a business's sales expectations for the coming accounting or budget period and attaches expected gross revenue to the sales plan. It can be expressed in both units and dollars. Smaller companies, with limited product categories and territories, may develop the sales budget for the business overall. Larger companies, with an array of products, usually aggregate the budget into product categories and/or geographic regions for the sake of simplicity and getting the job done on time. The sales budget is usually prepared and presented in a monthly and cumulative quarterly as well as annual format. Several departments will contribute to the sales budget. Of course, the majority of input comes from the sales team, who deals with customers on a day-to-day basis. Marketing contributes promotional information, which can affect both the timing and volume of sales. Product managers may have insight into new product development and release dates, as well as the discontinuance of older products. The executive team may review and revise figures based on their own insights. The sales plan is static and not concrete or etched in stone. It lives and breathes and loves to be updated with new information as environments and inputs change and progress. Overall, a sales plan can provide a very important directional and purposeful spreadsheet guiding the efforts of a business. The following is the information for quarters one through four for ArtCraft Pottery. The selling price per piece of pottery is $10.00. This forecast shows the sales budget for each quarter plus the total for the year. These are forecasted sales figures provided by the salespeople out in the field.